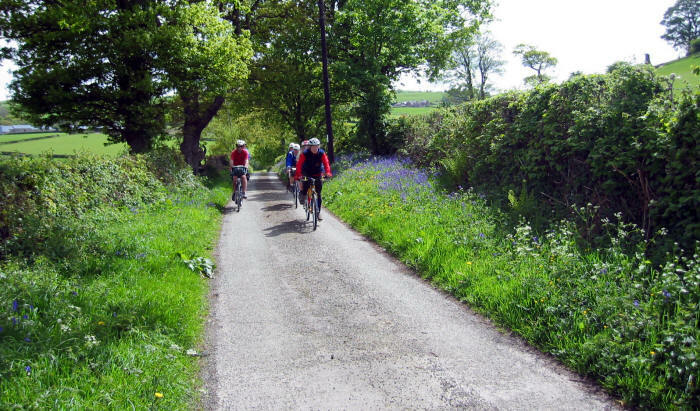 What about our Country Lanes – aren’t they ‘countryside’ too? During and after WW2 there was a programme on BBC radio called The Brains Trust. Listeners were invited to put questions to a panel of experts. This included Professor CEM Joad who invariably began his contributions with the words, 'It all depends on what you mean by...’. In other words there should be a consensus of what the words mean before attempts are made to provide the answer. So, following his example: ‘Harmony in the countryside’? ‘Harmony’ shouldn't present us with too much of a problem in defining. Agreement and concord between all parties, resulting in tolerance and understanding of the needs of all – although not always easy to achieve in practice. The landowners with duties and responsibilities of custodianship upon whom others make a living from working the land. But also those who for recreational or utilitarian purposes choose modes of passage, such as walking, horse riding, motoring or cycling, plus other interest groups too numerous list; each seeking to satisfy their needs with minimum interference from, or to, the others. But of course there is another party involved, the ‘natural environment’, which we all purport to care for, but which in practice is the first to be compromised and sacrificed when we seek to justify our individual stakes in the rural landscape. So if we are to talk about ‘harmony’, we must take account of the natural landscape in all its diversity. Now to the term ‘countryside’. What does it conjure up in our minds? Mountains, valleys, streams, deep flowing rivers? Meadows, and fields of swaying corn in a warm August wind? Hedges rich with with blossom, and home to many a feathered friend whom we would like to be able to recognise by name, but are content merely to know they are there? We all have our individual fond images of the countryside. But what of the country lanes and byways? Aren’t they the ‘countryside’ too? If so, why do we not have a policy to protect them? In truth many are ‘no go’ corridors unless you happen to be encased in metal and plastic and are travelling too fast to appreciate the passing landscape. The countryside should not simply be seen as that which lies beyond the wayside hedge, to which our legislators give so much attention. It should include the multitude of fascinating lanes and byways that bear witness to lifestyles long since passed into history, but which have bequeathed to us a priceless heritage which we abuse and destroy whenever it fails to serve our voracious demands for ever greater mobility at ever greater speeds. We need to look very carefully at what our increasing demands for more access to rural countryside means, if this results in the loss of this irreplaceable national asset and heritage. We simply have no policy in the UK to realise the inestimable value of the country lane, nor its intrinsic place in the rural landscape. All our thinking goes into facilitating human access on an ever-increasing scale to a rural landscape which just cannot cope. Frankly, the prospect of harmony as far as the natural landscape in concerned is pretty bleak. It is a fact of life that most access to the countryside involves a motor vehicle. Ramblers are invariably motorists at play. And even though cycling clubs are still to be seen heading out from our towns and cities, they are nothing like the numbers to be seen before the rapid growth of motor use over the past half century and more, and for whom motor assisted cycling has become almost the norm. In those post WW2 years, it was then still possible to penetrate deep into secret places without the feeling that our presence was a violation of nature itself. My own memories include such places as the Nant Rhydwilym in the Berwyns between Glyn Ceiriog and Llandrillo, where, with light hearted companions we paid homage to ‘Wayfarer’, the nationally famous bicycle borne lecturer, whose memorial stone now rests at the highest point of the pass. Little did the members of that esoteric cycling group, The Rough Stuff Fellowship, who laid their stone so many years ago, anticipate that their pastime of seeking wild and lonely places would become so popular, that together with the trampling of countless boots it would contribute to unacceptable levels of intrusion of natural habitats and ground erosion in so many precious places. Traffic is forecast to grow even higher, and fewer lanes and byways will retain motor vehicle levels enabling relaxed physically propelled enjoyment. Rarely do we see young parents pushing prams in country lanes, or children freely roaming and exploring the hedgerows. It’s perceived as just too hazardous. And what sort of relaxed pastime is it to travel in single file. Imagine the uproar if it was proposed that cars should be designed with their occupants stacked one behind the other! I see a connection between the degree to which we are creating a road environment, urban and rural, which is largely unfit for human scale occupation, and the extent to which we clamour for the land which lies behind the wayside hedge. We demand ever greater mobility and access. 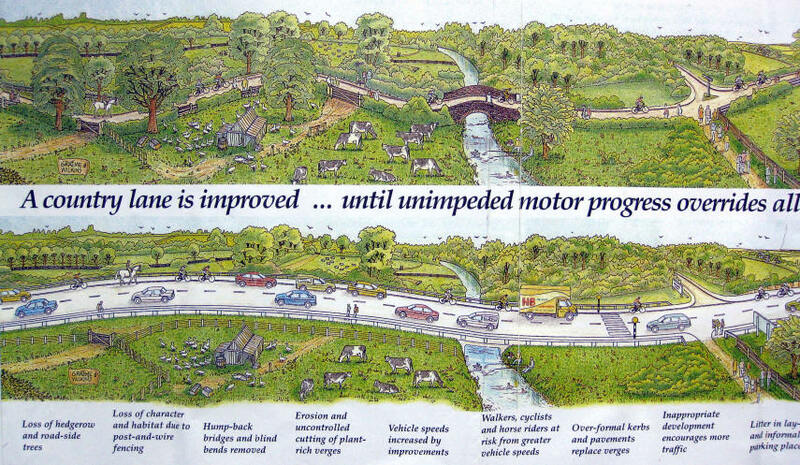 But in the process blind ourselves to the consequences for the towns, villages and country lanes in our path. It follows that that as we strive for the footpaths, bridleways and open countryside, we make our communities, small and large, noisy, polluted, and at times downright dangerous. We take these conditions with us on our trips to the countryside, and demand that the countryside and its dwellers meet our every need. I personally find something obscene in the innumerable newspaper and magazine articles exhorting us to make this or that journey of many miles by car, just to spend a few short hours rambling or cycling, when in truth there are often places unexplored and just as interesting – and perhaps much closer to home. We may find long car journeys to our liking. But, in environmental terms, the stress on the road system and the communities en-route surely means that we must find ways to make it more rewarding and satisfying to remain closer to home. The option must be there, especially for those not wishing or not able to make long journeys. The problem is obviously complex. And there are few quick-fix solutions. But many feel a sea change in our understanding is making it more likely the public is becoming more receptive to proposals involving a measure of personal restraint in how and when we access the open countryside. I am led to believe that if country lanes were selectively managed in a way which served to reduce the impact of motor vehicles, many more people would choose to spend more of their time using them for both leisure and utility journeys on foot, horse riding, or cycling. For those dependent on disability scooters and denied much of the countryside beyond the wayside hedge, it would an extra dimension to their countryside experience from which they are at present are largely excluded. We must have a policy for protecting country lanes. Not only for releasing their potential for leisure and safe active travel. But also as a diversion from the immense pressures on the open countryside lying behind the wayside hedge. Many bridleways and footpaths abutting roads with high levels of traffic are denied their potential utility for walking, cycling, and horse-riding . We should include these ancient rights of way, and those lanes closer to our towns and cities, within a framework for developing people-friendly circular routes. With the changing public mood towards innovative use of the rural landscape, I also believe the climate is now right for us to consider restricting traffic temporarily at weekends and public holidays for recreational purposes. In carefully chosen locations, this could release lanes of high amenity value, and at the same bring into play public rights of way which may no longer be serving their original purpose. A partnership of all, not least local residents, could yield rich environmental, health, and social benefits for all. ‘Agenda 21’ proclaims the environmental agenda for the 21st century. It calls upon us to Think globally, and Act locally. Perhaps ‘Stay Local’, should also be tagged on. This paper was presented on behalf of the Cyclists’ Touring Club to a 1999 conference on ‘Harmony in the Countryside’, organised by the Wrexham and District Bridleways Association. Papers were also presented by the Ramblers Association, British Horse Society, Country Landowners Association, Countryside Council for Wales, National Farmers Union, and the Council for the Protection of Rural Wales. The images on this page are from Cyclists’ Touring Club sources. Active Travel (Wales) Act 2013: Will it serve for the rural environment, what it promises for the urban? Tandem Club members in the Elwy Valley, North Wales.